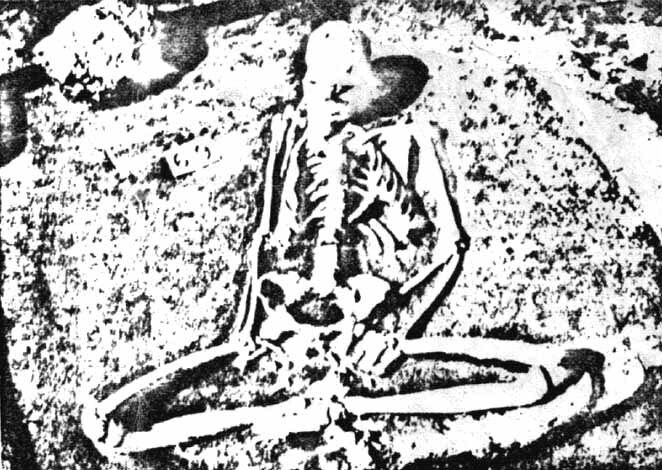 Skeleton of a man in the position of zazen, discovered in the excavations of Lepenski Vir, in Yugoslavia, dating: 6000 years BC. 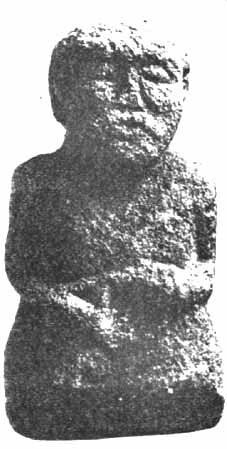 Zazen in prehistory. Master Deshimaru was teaching, "zen is zazen". That is to say that, etymologically "the absorption"; the concentration absorption (Jhana, in pali) is linked to the posture in which Buddha is generally represented. History recalls that it is in this posture that Buddha reached awakening some 2600 years ago. Posture, existence and vacuity (Ku) are linked together. However this posture of ecstasy ("ekstasis", position outside one's self, distant from the self, beyond the self, "ek" outside, beyond and "stasis" stillness, substance), comes back to much more ancient times than the one of the historical Buddha. From the moment where we know well the zazen posture, according to the precise teaching of Master Deshimaru, it is possible to find back its evident traces in other ancient cultures and moreover in the protohistorical statues. 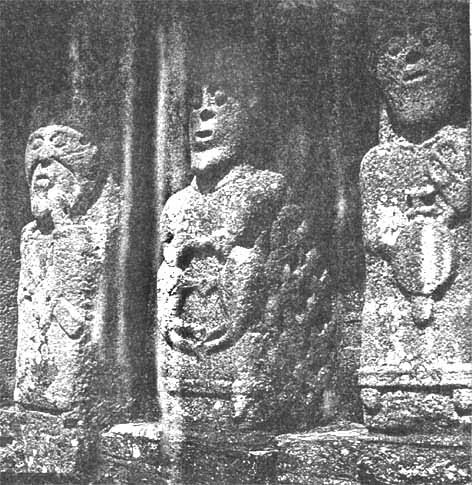 Master Deshimaru himself had brought the attention of his students on some characters sculpted in the 11th century A.C., in the Fermanagh County, in Ireland, of which the position of the head, the chin pulled back, and the position of the hands evoked evidently zazen although the legs were not represented. However, these statues allowed supposing that other characters in a full posture could be rediscovered in Europe. So, a character used as a handle of a bucket, "the bucket of Oseberg", in Norway, from the first century A.C., shows the same position of the head and moreover he has the legs perfectly crossed like in zazen and wears on his chest a kind of "rakusu". However, the archeologist E. Esperandieu who started first, from 1907 to 1947, a systematic research on the Gallic statues gave us the most important information. E. Esperandieu puts in evidence the great number of statues of "gods sitting in the Buddhist posture", following his expression, in the entire France, from the North to the South and from East to West, with a concentration of those in the Central massif. According to the specialists of his team, these statues come back at least from the 5th century B.C. (that is to say that they are at least contemporary with the historical Buddha or even older). Some of them are more recent. Their production stops however with the supremacy of Christianity in Europe. Most of the ones that have been found have been intentionally mutilated. The majority of these have been destroyed. Effectively, "the destruction of the stone idols" has been proclaimed, let us recall, from the first Christian Councils. When in 496 Clovis, king of the Franks, first king of our history, got baptized as a Christian, in Reims, "with three thousands of his warriors", the bishop of Saint Remi told him these famous words, recalled by Gregoire de Tours and Michelet: "Bend down, proud Sicambre, burn what you have adored, and adore what you have burned". 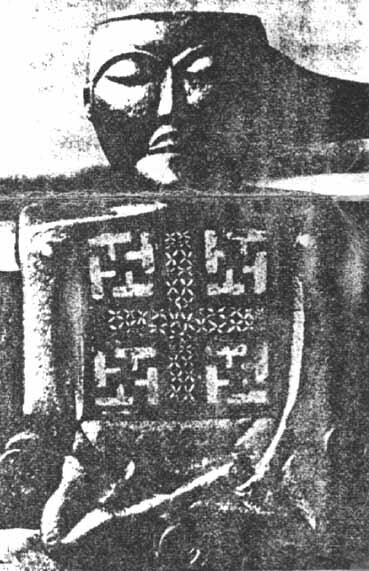 "Adore what you have burned" is however related to the god Cernunos, the "god of the prosperity and abundance", generally represented, as the archeologists tell us, sitting cross-legged in the Buddha posture. Cernunos, as Cesar recalls in his "Comments about the Gaullist war" (1st century B.C.) "was the most revered god of the Gauls" (VI, 17).